"Do...or do not. There is no try!" - Star Wars Lesson 3 - Motivate Amaze Be GREAT: The Motivation and Inspiration for Self-Improvement you need! This the scene where Yoda challenges Luke to take the spacecraft out of the swamp with the power of the Force. Luke doesn't believe his able to do it, nor less he believes the Force has all that power, so he gives his master the honest answer about his feelings...Yoda replies and then proves it can be done by lifting the huge spacecraft out of the swamp with the Force as his ally. Luke: "All right, I'll give it a try." Yoda: "No. Try not. Do... or do not. There is no try!" This one of the greatest Star Wars inspirational quotes because it clearly shows one of the ways to succeed. Let’s get it straight…you have to do if you want to succeed no way around it. Sometimes we say you have to try, and that trying is better than not trying if you want to succeed. And that’s truth also and you can eventually succeed by trying. First conclusion from this Star Wars inspirational quote: we can get results by doing and by trying. If we don’t do nothing there are no results. 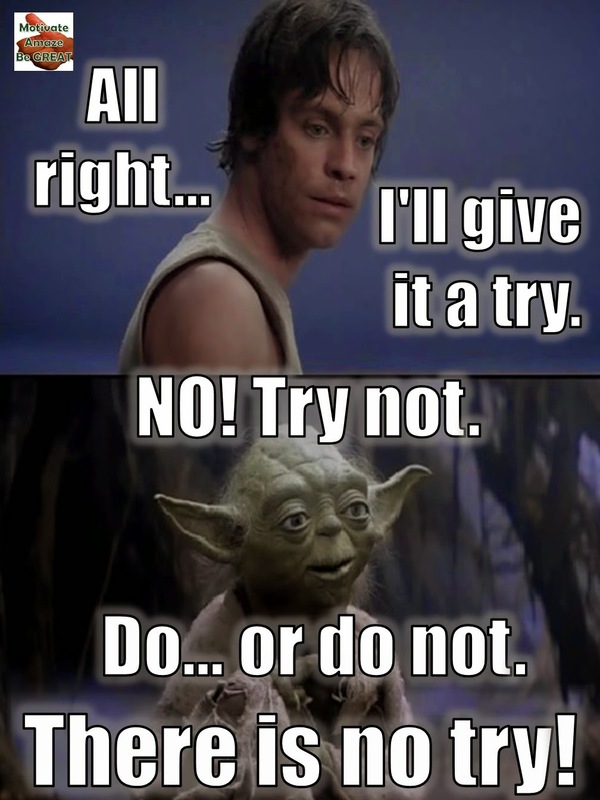 So what’s the point Yoda is trying to make, if you can get results by trying? You won't get all the results you want if you just try. Trying is different from doing, it’s something that’s really not complete. If you try to eat bread, you will make an attempt to eat it. We can never tell if you will eat it or not. But you do, if you do eat bread, there is no guessing, it’s done, you have ate. If you try it’s anyone’s guess what the end result will be. When you do, you put full effort on it. When you try, you don’t push so hard, you just “kind of do it”, “kind of”, it’s no actually doing. So what Yoda really wants it’s for Luke to really do it, to put full effort on it, to believe his able to do it, not to just try it and “kind of doing it”. When you do, your beliefs are aligned with what you’re doing, so you put all of yourself into it. You go all in, full of energy and certainty. When you try, you’re doubtful about it, you don’t bet all the chips into it. You go half in, half out, low or no energy at all. So between the two, which one is going to give you all the results you want? Doing, no doubt about it. So when you are in trouble, don’t try do get out of trouble, just get of trouble by taking the necessary actions. When you want to achieve something, take the necessary actions to achieve that something.